Syrian military source confirms Hezbollah engaged in major op. near Israeli border. Monitor says it's now leading regime forces. Hezbollah has taken the lead role on a key frontline in southern Syria near the border with the Israeli Golan Heights, a monitoring group said Tuesday. A Syrian military source confirmed Hezbollah was engaged in fighting in Quneitra and Daraa provinces as part of efforts to stop rebels advancing in the area. Those comments echo a recent statement by Syria's foreign minister, who acknowledged Hezbollah's strong presence in the Syrian-controlled Golan Heights. Shia Islamist Hezbollah and President Bashar al-Assad's troops launched a new operation on Sunday to reclaim swathes of territory captured recently by rebels including the Sunni Islamist Nusra Front, according to the Syrian Observatory for Human Rights. "Hezbollah has taken the initiative to lead army and Iranian forces in the triangle of territory linking Daraa, Quneitra and the southwest of Damascus provinces," said Rami Abdel Rahman, director of the British-based monitoring group. "The frontline is on the border with the occupied Golan Heights," he added, using the term for Israel's side of the mountain range employed in the Arab world. "They have since taken back a string of villages and hills." Iran has acknowledged sending "military advisers" and high-ranking officers from the elite Revolutionary Guard to help its ally Assad, and a growing number of Iranian soldiers and "volunteers" have been killed in fighting with rebels. However, unlike the Observatory, the Syrian military source said the Syrian army was leading the offensive. "The Syrian army and its allies, including Hezbollah, are fighting battles against armed groups in Quneitra and Daraa provinces," the source told AFP on condition of anonymity. He added that the goal of the campaign was to "put a stop to the armed men's attacks, (as they inch) towards the capital." Syrian rebels and the Al Qaeda-affiliated Al Nusra Front have in recent weeks made sweeping gains in the south of the country. Daraa and Quneitra are important because they are located near Damascus, Jordan and Israel. Hezbollah first acknowledged it was sending troops into Syria to back Assad in early 2013 against the mainly Sunni rebels. 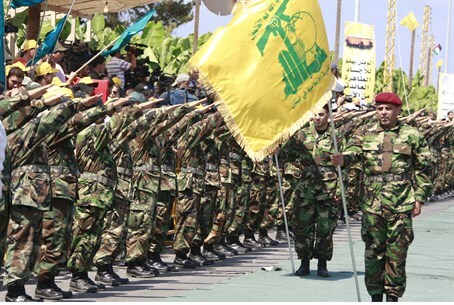 According to the Observatory, about 5,000 Hezbollah fighters are now deployed across the country. The Shia terrorist group - once popular throughout the Arab and Muslim world, even among many Sunni Muslims - has since faced an angry backlash, particularly from Sunnis, for its part in backing Assad's bloody campaign to crush the four-year rebellion. Hezbollah has also faced some pressure and discontent from its Shia support base in Lebanon. It has been criticized for dragging Lebanon into the conflict, triggering a spate of deadly attacks by Sunni Muslim terrorists in revenge, as well as over the steadily-rising Lebanese death toll inside Syria itself. A recent report claimed some 640 Hezbollah fighters had been killed in the Syrian civil war so far. On January 18, six Hezbollah fighters including a senior commander were killed in an Israeli strike in Quneitra, together with an Iranian general and several Iranian soldiers. Hezbollah said the fighters were involved in "reconnaissance" in the area, and responded soon after by attacking an Israeli military convoy, killing two soldiers.